Young circumstellar are of prime interest to understand the physical and chemical conditions under which planet formation takes place. Only very few detections of planet candidates within these disks exist, and most of them are currently suspected to be disk features. In this context, the transition disk around the young star PDS 70 is of particular interest, due to its large gap identified in previous observations, indicative of ongoing planet formation. We aim to search for the presence of planets and search for disk structures indicative for disk-planet interactions and other evolutionary processes. 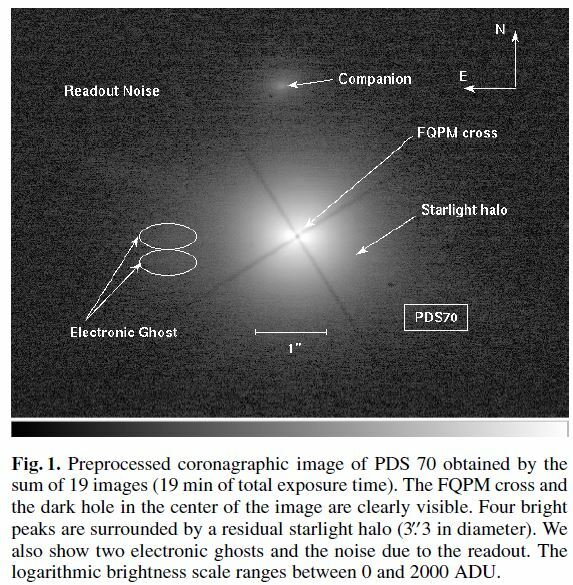 We analyse new and archival near-infrared (NIR) images of the transition disk PDS 70 obtained with the VLT/SPHERE, VLT/NaCo and Gemini/NICI instruments in polarimetric differential imaging (PDI) and angular differential imaging (ADI) modes. We detect a point source within the gap of the disk at about 195 mas (about 22 au) projected separation. The detection is confirmed at five different epochs, in three filter bands and using different instruments. The astrometry results in an object of bound nature, with high significance. The comparison of the measured magnitudes and colours to evolutionary tracks suggests that the detection is a companion of planetary mass. We confirm the detection of a large gap of about 54 au in size within the disk in our scattered light images, and detect a signal from an inner disk component. We find that its spatial extent is very likely smaller than about 17 au in radius. The images of the outer disk show evidence of a complex azimuthal brightness distribution which may in part be explained by Rayleigh scattering from very small grains. Future observations of this system at different wavelengths and continuing astrometry will allow us to test theoretical predictions regarding planet-disk interactions, planetary atmospheres and evolutionary models. Aims: We aim to characterize the orbital and atmospheric properties of PDS 70 b, which was first identified on May 2015 in the course of the SHINE survey with SPHERE, the extreme adaptive-optics instrument at the VLT. Methods: We obtained new deep SPHERE/IRDIS imaging and SPHERE/IFS spectroscopic observations of PDS 70 b. The astrometric baseline now covers 6 years which allows us to perform an orbital analysis. For the first time, we present spectrophotometry of the young planet which covers almost the entire near-infrared range (0.96 to 3.8 micrometer). We use different atmospheric models covering a large parameter space in temperature, log(g), chemical composition, and cloud properties to characterize the properties of the atmosphere of PDS 70 b. Results: PDS 70 b is most likely orbiting the star on a circular and disk coplanar orbit at ~22 au inside the gap of the disk. We find a range of models that can describe the spectrophotometric data reasonably well in the temperature range between 1000-1600 K and log(g) no larger than 3.5 dex. The planet radius covers a relatively large range between 1.4 and 3.7 R_jupiter with the larger radii being higher than expected from planet evolution models for the age of the planet of 5.4 Myr. Conclusions: This study provides a comprehensive dataset on the orbital motion of PDS 70 b, indicating a circular orbit and a motion coplanar with the disk. The first detailed spectral energy distribution of PDS 70 b indicates a temperature typical for young giant planets. The detailed atmospheric analysis indicates that a circumplanetary disk may contribute to the total planet flux. Image of PDS 70b. Rather spectacular image! The first spatially resolved image of the disk was obtained by Riaud et al. (2006) together with the detection of a companion candidate at 2.2" to the North of the host star using the NaCo instrument in the Ks filter. The companion candidate was later identified as a background source (Hashimoto et al. 2012). Wagner et al. "Magellan Adaptive Optics Imaging of PDS 70: Measuring the Mass Accretion Rate of a Young Giant Planet within a Gapped Disk"
Accretion rate estimated to be 10-8±1 Jupiter masses per year, main contribution to the uncertainty is the amount of extinction from the circumstellar and circumplanetary discs.